Bones of the Empire, by Jim Galford. Seattle, WA, CreateSpace, August 2015, trade paperback $13.99 (508 pages), Kindle $2.99. Bones of the Empire is Book 5 and the conclusion of Galford’s The Fall of Eldvar series. It connects the events in both Books 1 & 2, In Wilder Lands and Into the Desert Wilds, and Book 4, The Northern Approach. This is a continuous series, so it assumes that the reader is familiar with the events in the four prior novels. If you have not read them yet, you had better start with the first and read them in order. This is not a chore; the whole series is a single gripping adventure. Eldvar is a world of humans, elves, dwarfs, talking dragons and more, including the wildlings who are anthropomorphic animals. The story’s focus on the wildlings is why the novels of The Fall of Eldvar have qualified for previous reviews. Most of the setting is similar to the eastern foothills of the Rocky Mountains. 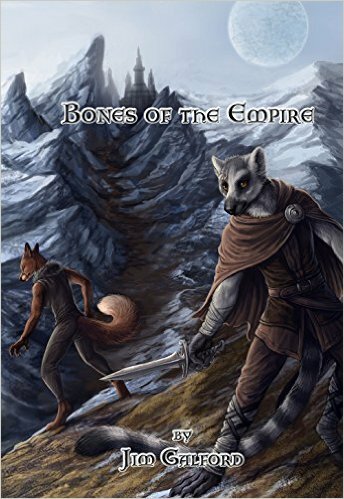 (Bones of the Empire debuted at Rocky Mountain Fur Con 2015 in Denver.) The Northern Approach was about Raeln (a wildling wolf) and On’esquin (an orc), the leaders of a group of desperate refugees from fallen Lantonne fleeing the conquering Turessi necromantic armies of zombie warriors, abandoning the refugees to set out alone to fulfill the prophecy to overthrow the necromancers. That group meets up with the party of wildlings, humans, fae-kin, and everything else led by Estin (a ring-tailed lemur wildling) and Feanne (a red vixen) from the first two novels. 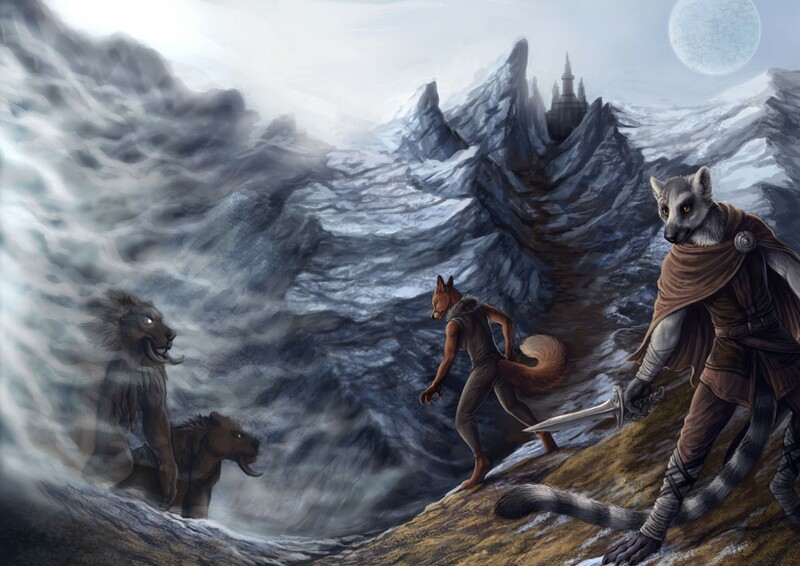 (The wraparound cover by Rukis features Estin, Feanne, and two fanged dire wolves.) The four volumes of the series come together for this finale. As Bones of the Empire begins, Estin is harried between those of his group who want to stop and make a stand against the necromancers and their undead troops, and those who want to continue running and hiding from the warfare around them. Estin’s core group consists of six: himself and Feanne, the fae-kin woman Dalania (unclothed, green-skinned, and covered with living vines and leaves), the tall wolf wildling Raeln, and two humans: Yoska, elderly and untrustworthy, and Turess, from an unknown culture who does not speak anyone’s language. Turess is apparently over two thousand years old and is the founder of the Turessi necromancers, but he has turned against them. Turess seemed to understand the objection and said something more. And to hint at another spoiler, the wildlings turn out to be more important than anyone imagines at first. Believe it or not, after five books there is a definite conclusion – and a more-or-less happy ending. It’s been a long journey; five books, 2,373 pages, and, for those who started when In Wilder Lands was first published, five years. But the journey has been worth it.